If you cannot solve your error problems using the following information, please contact Lighthouse data and include your version and license number. 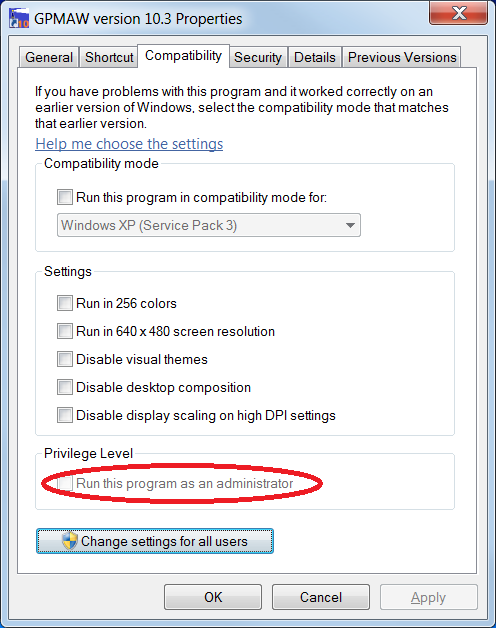 The license number is on the install CD or in the installed program you can go to Help | Help about… in the main menu. If the installation program refuses to start and/or complains about a missing SFX file (a file called “gpmaw.lcs”) you are missing the license file. You have to obtain this, either from the original installation CD (open the CD and copy the gpmaw.lcs file from the root directory to the same directory as the install file on the hard drive) or copy it from your old installation (\Program Files\gpmaw\bin\). Alternatively you may have it mailed from Lighthouse data. Alternatively you can install the demo version of GPMAW and then an upgrade version to get to the current version. This is then likely to run in demo mode, unless you copy the ‘gpmaw.lcs’ file to \Program files\gpmaw\bin\. Please check that you are using the correct install file. The 64-bit version (GPsetup64.exe) will not run on a 32-bit Windows and visa versa. Finally it is possible in some cases to run the program from a USB stick or from the users ‘Document’ section on the hard drive. You need to copy all the files as outlined here. The files and file structure may be copied from an installation disk or an existing installation. After copying, you have to manually place a shortcut on the desktop. If you cannot change or save your files, if will likely be caused by Windows User Access Control, and you will have to move the default location of your files. This can be a question of both data files (i.e. sequence files), system files (mass and modification files) and the .ini file. Please check here for details on how to change this. Ms/ms- search will not run. Wrong version of X!Tandem installed. In a few cases there have been a mix-up of 32- and 64-bit versions of the X!Tandem program (‘tandem.exe’). Solution: a) reinstall GPMAW and X!Tandem from the original disk. Alternatively, the error may be related to your login. If you log in with a user name that contains non-standard characters or punctuations, this will disturb the transfer of file information from GPMAW to X!Tandem. This has been corrected from version 10.1 (or beta versions after June 1, 2015). The error is caused by a bought-in library which saves its state to an ini-file, placed in a location that got inaccessible after a Windows update. The error is irritating but harmless. Try to update to a newer version with the error fixed.